Having made the decision to have an adventure to Bolivia in search of two elderly Sulzer powered locomotives, the travel guides were consulted to research what attractions might be of interest to this wayward traveller. With a desire to sample some of the passenger trains a check of the possibilites showed that the Oruro - Villazon service was a strong contender. A look at the map of the route showed that the route passed through Uyuni, which received several references in the tourist guides. Of great interest was the 'cementerio de trenes', the train cemetery located south of the town at the junction where the lines to Chile and Argentina separate. Since the Oruro - Villazon service was basically an out and back working which left the traveller with the possibility of a 24 hour stay at Uyuni, the decision was made to forego the Uyuni - Villazon route for another time. Another factor in the decision was that a considerable amount of the journey would have been at night. So on the southbound trip we arrived at Uyuni late in the evening, accomodation was obtained at the Hotel Avenida across the street from the station. The nightime arrival shielded the traveller from the reality of the location of Uyuni until the next morning. But whatever the location the day dawned bright, cold and clear for the 11,000 or so residents of Uyuni and a small number of tourists. At an elevation of about 3,660 metres during the spring season the days start out very chilly and if the sun shines they can get a little toasty later in the day. The guide books describe the conditions as 'harto frio' or 'frigido', in other words cold or climactically challenged. After a fine cooked breakfast around the corner at a cafe on Av Arce a walk was taken up Av Ferroviaria to investigate the plinthed steam locomotive in the middle of the street (see view above). This locomotive was one of a pair of 2-8-4T Hunslet's, works numbers 1102 & 1103 of 1912, built for the FCAB and numbered 101 & 102, later 411 & 412 and as 551 & 552 in the ENFE numbering. Although showing the number '551' this is infact 552. The 551 is one of sixteen locomotives parked at the back of Uyuni shed (as of April 2008). Photographs of this locomotive in service show it being equipped with an American style cowcatcher, a large boxy headlamp, only one airpump and an extension to its bunker to allow it to carry a greater quantity of fuel. The view above is looking south, the railway facilities including the station are on the left whilst much of Uyuni's central business district is off to the right. After inspecting the plinthed Hunslet the walk was made down to the 'train cemetery'. This is not difficult to find, just follow the railway tracks south until you reach the junction of the the lines to Chile & Argentina. The guide books say its about one kilometer, I thinks its a little further than that. There are two distinct lines of abandoned steam locomotives as well as an area at the north end of the yard which is just a jumble of partially dismantled equipment. The three views above show the eastern most line of withdrawn locomotives, the left view is taken looking northwards towards Uyuni, whilst the right view is from the other end of the line looking in a southwesterly direction towards Chile. The center view shows the typical condition of the locomotives. Rust is the order of the day here, very little paint remains on any of these locomotives. These three views feature the western most line of withdrawn locomotives, the left view is taken looking northwards towards Uyuni, visible behind the remains of the wagon to the left is the railway line from Uyuni to the border with Chile. The right view is from the other end of the line looking in a southwesterly direction towards Chile. The center view shows one of the locomotives in the line, athough heavily stripped of many critical parts it is still recogniseable for what it is. Many of the locomotives here are seriously dismembered and often little more than a jumbled array of parts. When the wind blows here it invariably brings every piece of loose plastic from the town rubbish dump, the plastic items becoming caught on any sharp object in the graveyard. With the line to Chile visible passing the yard off to the right a solitary skeleton of a locomotive faces southwest. The scenery behind the locomotive is indicative of the Salar de Uyuni. After the end of the graveyard is reached the railway line to Chile is the only manmade thing visible until it blends into the arid landscape. This is the route of the Antofagasta & Bolivia Railway (FCAB), running from the port at Antofagasta to Uyuni, Oruro & La Paz. For most of its route in Bolivia the line remains between 12,000 & 13,000 feet above sea level. Its only at Ascotan, Chile where the line begins its 230 mile descent from 13,000 feet down to sea level at Antofagasta. In this view the landscape will remain unchanged for about 100 miles southwest to Ollague as the railway skirts the south side of the Salar de Uyuni. If luck comes your way whilst visiting the scrapyard at Uyuni you might witness a train passing. In this view from April 2008 the 'International Mixed' passes the yard at the end of its journey from Chile. To the left of the locomotive can be seen some of the abandoned steam locomotives. A Beyer Garrett locomotive stands severely dismembered in the middle of one of the lines. Parts are scattered everywhere, why the wheels were put here, who knows? Uyuni sits at the southeast corner of the Salar de Uyuni, a 12,000 sq-km salt pan, which is a growing tourist attraction. It also provides an industry for the mining of salt, much of which leaves the area by rail through Colchani (north of Uyuni). At the north end of the yard where the two distinct lines of steam locomotives ends the yard turns into a jumble of equipment. There is a mixture of dismantled steam locomotives parts, other rollings stock, both freight and passenger and other miscellaneous scrap items. Some of the rolling stock appears to be there because it sustained collision damage at some point whilst other equipment appears to be simply life expired. The above three views all feature some type of passenger carrying rolling stock. The coaches in the left and right views still carry quite a bit of original paint and lettering whilst the center view shows an all steel coach probably dating from about 1950. Although it appears to be almost devoid of paint it would have carried a green livery when new. Three other views (above) feature other identifiable rolling stock. The left view shows freight cars to the left parked in somewhat of an orderly fashion whilst to the right of them is a jumbled collection of wagon and bodyside frames, all tossed about. The second view shows a jumble of scrap, including two tenders and several types of freight wagons. And the third view, looking in the direction of Argentina show what maybe a baggage coach, a varied selection of wheels, and the body of a tender turned end on to the photographer. Out to pasture on the eastern edge of the yard is what appears to be the remains of a locomotive tender. FCAB 451 L07-011 2-6-0+2-6-0T Beyer Peacock 5617 1913 . FCAB 452 L15-021 2-6-0+2-6-0T Beyer Peacock 5618 1913 . FCAB 454 L01-002 2-6-0+2-6-0T Beyer Peacock 5620 1913 . FCAB 455 L14-020 2-6-0+2-6-0T Beyer Peacock 5621 1913 . FCAB 456 L16-022 2-6-0+2-6-0T Beyer Peacock 5622 1913 . 660 (FCVA 4?) L06-008 2-8-2 Borsig 11846 ? 1925? . 703 (FCVA 6) L04-006 2-10-2 Borsig 11956 1927 . 715 L13-019 4-8-2 Borsig 14596 1935 . 904 (FCAB 394) L05-007 4-8-2+2-8-4 Beyer Peacock 7421 1950 . 908 (FCAB 398) L02-004 4-8-2+2-8-4 Beyer Peacock 7425 1950 . 909 (FCAB 390) L08-012 4-8-2+2-8-4 Beyer Peacock 6524 1928 . The above listing is gracefully provided by John Middleton following a visit during April 2008. There are eighteen locomotives listed but FCAB 453 is identified only by a number of parts partially buried at the north end of the yard. Old & New in the scrapyard at Uyuni. Despite the gloriousy sunny weather and clear skies the attire of the local boys suggests the temperature is on the cool side. If nothing else the view provides an insight into the construction of a steam locomotive. Two views taken alongside the Uyuni - Chile line with the scrapyard in the background as a four wheel maintenance of way 'speeder' No. Z529 passes by. FCLPA (FC La Paz - Antofagusta) No. 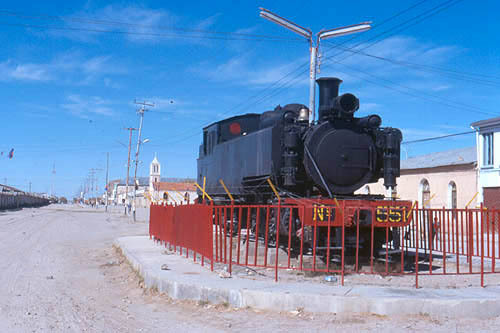 813 at Uyuni on October 10th 1974. Formerly FCAB 343 Vulcan Foundry 4-8-2. If Uyuni is perhaps the most visible of the resting places for portions of Bolivia's steam locomotive fleet, one doesn't have to travel too far to find other examples, although one must be cautioned that the accessibility of many of these locomotives is very limited. Sucre is the home of the El Tejar workshops which are used to house the modern railbuses that work the Sucre - Potosi service. However the vast majority of the locomotives and other rolling stock found in the two workshops have not turned a wheel in many, many years. FCPS Mallet No.4 on October 4th 2009. Parts of sister locomotive No.3 could be found elsewhere in the shrubbery growing in the Works yard. FCVA No. 12 on October 4th 2009. Also present are the remains of the two ex Nordhausen-Wernigerode Mallets. Incredibly it appears that together with Alco 655 at Potosi, the entire known roster of the FC Potosi-Sucre-Tarabuco survives. �	669 � Boiler, cab and cylinder block only, frame mostly cut away. Tender on other side of yard. 669 on cabside and smokebox. �	(FCPS 3) (1st) � assumed - dismantled � the two frame units lying next to each other, firebox only remains of boiler, no cylinders but wheels intact, one side tank lying in undergrowth. Carries no identification. �	(FCPS 5) � assumed � boiler (same as FCPS 6) and part of frame plus cylinder block of small US design loco, some wheels lying alongside. Carries no identification. FCPS 4 (1st) � lying in undergrowth between the main workshop and the railcar workshop, behind a wagon and easily missed. Both frame units, wheels and part of smokebox survive, no cylinders. Some brass parts stamped 4. �	(FCPS 2) (2nd) � Assumed � one of the 1923 Alco�s - Boiler (part cut), cab and parts of frame plus some wheels survive. No cylinders or tender. No identification on loco. �	(FCVA 5) � Assumed � but definitely a Borsig 2-8-0 - but no identifaction on loco. Boiler (part cut), part of frame and some wheels survive, no cab or cylinders, no tender. �	(FCPS 3) (2nd) � one of the 1923 Alco�s � Boiler (part cut), cab, part of frame, tender (lettered FCPS 3) and some wheels survive. No cylinders. 652 � Inside Workshop, complete. This loco has been rebuilt with its running plate raised by about 18� and the smokebox side valances removed which completely changes its appearance compared with shots in �Railways of Bolivia�. BBP 11771/1929 which means either the boiler was swopped with 651 (at Oruro with BBP 11772/1929) or the accepted ENFE re-numbering from FCCSC 1-2 to ENFE 651-652 is transposed. Two complete locomotives inside one of the buildings on October 4th 2009. The locomotives are No. 652 & 663. 706, 662 � Outside Workshop � complete. 662 has FCALP 202 on rods no BBP; 706 has BBP showing FVCA 12 and Baldwin 64621 of 1943. The working railcars, and the derelict Dodge rail lorry conversion were found in the main workshop. The remainder were housed in the old railcar workshop. The collection included many of the original FCPS 1930�s railcars built by Wayne, Indiana, photos of which appear in �Railways of Bolivia�. Renumbering from FCPS numbers (which included 11 and 14) to ENFE is unknown. One still carried a Wayne worksplate. One of the unidentifiable Wayne 1930�s railbuses has severe wreck (rollover) damage, another may be 260 a photo of which appears at Sucre on page 121 of �Railways of Bolivia�. Note there are two �261�s� in the shed. 215 and 217 are conversions of 1930�s US built cars. In the yard was an old road bus body painted yellow (no numbers) which looked as if it may have been undergoing (abandoned) conversion to rail use. A view looking into the old railcar shop, October 4th 2009. El Tejar information, unless otherwise stated is courtesy of John Middelton. Southwest of Sucre lies the city of Potosi, which as mentioned elsewhere is connected to Sucre by a railbus service. The shed at Potosi frequently houses diesel locomotive and inspection vehicles. Three steam locomotives are present outside the two road shed. The Garratt stands at the front of the shed next to a 1910 water column made in Yorkshire, the other two steam are at the back of the shed. The Garratt carries its FCAB number whilst the other two carry ENFE numbers. Present in front of the shed at Potosi on October 3rd 2009 was FCAB No.397, a 4-8-2+2-8-4 Garratt from Beyer Peacock, works number 7424 of 1950 vintage. Another view of the Beyer Peacock locomotive, with the background featuring typical scenery for the area. It was from mines driven into hillsides like these that incredible amounts of wealth were generated from the mining of silver & tin. At the back of Potosi shed are two steam locomotives, a 1923 Alco and a 1958 Hitachi which is the subject of most of this view. Within ten years of the arrival of this locomotive diesels were being shipped to Bolivia to eventually replace many of the relatively modern steam locomotives. Ironically many of these diesels came from a Japanese manufacturer. From an era when British products were exported throughout the world, the water column at Potosi, dated 1910 (and now over 100 years old), reveals its maker, a firm of hydraulic engineers from Brighouse, Yorkshire. Just yards away stands a product from Manchester, England - a Garratt locomotive from the factory of Beyer Peacock. If the pictures above portray a country which was reached somewhat by the salesman of the Victorian era Industrial Revolution manufacturers it should not be forgotten that three centuries earlier the plundered wealth of Bolivia helped support the Spanish empire and other European nations feeding of the Spanish galleons returning to Spain with their holds loaded with Bolivian silver. Much of this wealth came from the region of Potosi and in particular the Cerro Rico (silver mountain) which towers over Potosi and can just be seen in one of the photographs above. The silver mines started to play out during the mid 19th Century, but mining continues today with tin now being the primary ore mined, silver, lead, zinc and copper are also extracted in smaller quantities from the mines and the tailings. The largest mine still worked in the area is the Empresa Minero Metallugica Potosi SA (EMMPSA); Pailaviri Mine. The mine uses a 500 mm gauge overhead electrified line running from a sub-vertical shaft underground out to a tipping point. Ore is now taken away by road to another mill but there is a large derelict mill and a derelict aerial cableway adjacent which were closed over 30 years ago. The mine has 12 levels going down some 700 metres, accessed via the sub-vertical shaft which likely use battery locos. A view of the Potosi Pailaviri mine with a Goodman electric locomotive hauling some mine cars, October 2009. With thanks to John Middleton for much of the tabular information and many of the views at El Tejar & Potosi. Last updated August 12th 2014.